When Seoul architect Byoung-soo Cho set out to design his urban dream house, he turned to the city’s architectural history for inspiration. The result—–four overlapping boxes arranged around a courtyard—–is a peaceful enclave in the midst of the nonstop metropolis. Four Box House perches on a rugged mountain-side in northern Seoul’s Pyeongchandong district, making for spectacular views. Architect Byoung-soo Cho and his wife, Eunsil Kim, value the privacy, and style, that a concrete wall and recycled Indonesian teak facade provide. Light from windows on all four sides spills over the dining room’s custom-made teak table. The courtyard offers a glimpse of nature from nearly every angle, including up. The central courtyard helps cool the house. A view of the dining room from the courtyard. A single crepe myrtle, which sports red blossoms in summer, defines the courtyard. Cho relaxes in the first-floor living room, where paintings by up-and-coming Germany-based Chinese artist Ruo Bing Chen play off a sofa and coffee table designed by the architect himself. Arco’s Jolly Jubilee chairs, designed by Ineke Hans, give the downstairs living room a shot of color. Textured concrete walls are a signature of Cho’s work. 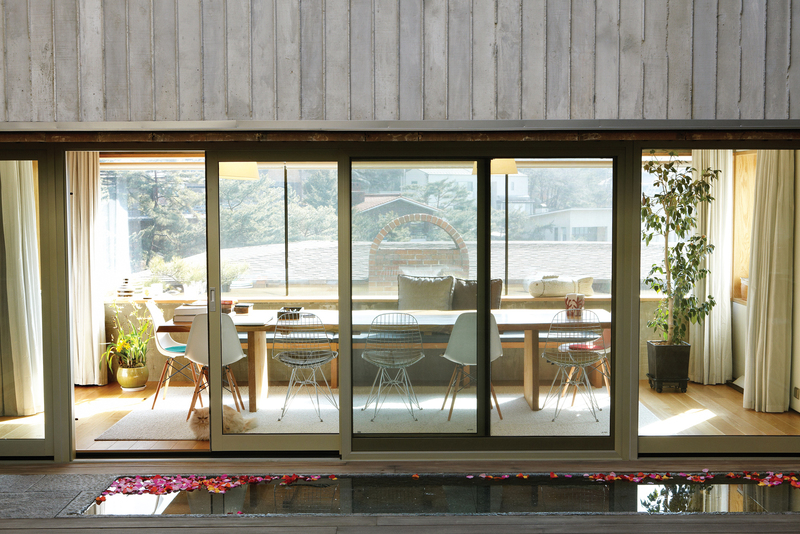 Strategically placed wooden windows like this one is an expression of Cho's style. Light is a key element of the home’s design. Photography lights from a local manufacturer keep the basement studio bright. Paper-covered walls in the tea room on the second floor soak up a softer incarnation of the sun’s rays. Stepping out of a frigid January afternoon in northern Seoul, South Korea, and into the warmth of his 18-month-old wood-and-concrete home, Byoung-soo Cho grins. “There’s snow in my living room!” he says gleefully. 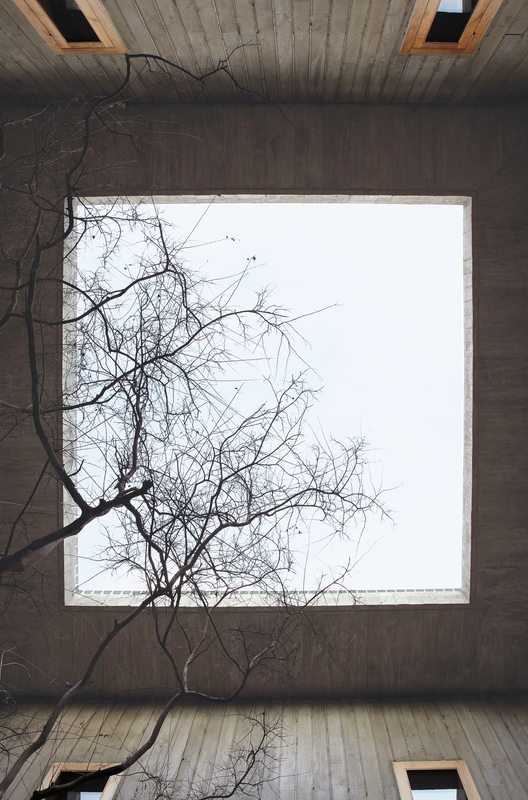 Of course, the leafless tree and haphazard pile of snow that Cho is gesturing at are not literally in his living room; they are in a square, glassed-in courtyard that merges inside and out so seamlessly that it induces periodic fits of disorientation in visitors and residents alike. That simple open-air space, says Cho, was the key to designing a comfortable, elegant home in one of the world’s most hectic megacities. The Seoul native grew up in just such a traditional house and fondly remembers its chaotic courtyard filled with family and dogs. 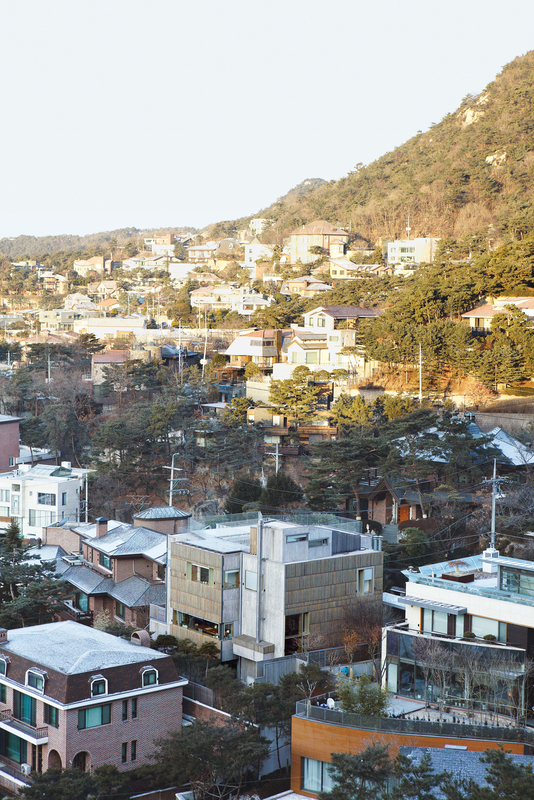 But when he and his wife, Eunsil Kim, bought a hillside lot in the recently developed neighborhood of Pyeongchangdong and began planning their future home, centering it around a similar space didn’t occur to him. “We purchased the land in 2002 and started talking about the design whenever Byoung-soo had time,” says Kim, 46. Back then Cho was flying frenetically between his acclaimed private practice in Seoul and teaching jobs at Montana State University and Harvard. (He has since resigned from both positions to focus on the firm.) When he finally was able to devote himself to the project, it proved unexpectedly challenging. “For six months I tried different schemes. Nothing worked, and I realized the constraints were stronger than I had thought,” he recalls. Those constraints are typical of Seoul, where nearly a quarter of South Korea’s population lives in tightly packed apartment complexes, older brick buildings, and a scattering of single-family homes. Pyeongchangdong is an attractive residential district spread over the rugged mountains north of downtown—a plus for Cho and Kim, who both love to hike. However, houses within 20 feet on three sides of the lot blocked sunlight and views. Then Cho hit on the idea of arranging four two-story, rectangular concrete boxes around a central courtyard. The layout resembles a top-down view of a cardboard box with all the flaps open. Because the sides of the boxes overlap only partially, the house has indented corners, which means each box can have windows on all four sides. The result is a house that—far from feeling oppressed by urban clutter—is flooded with sunlight and fresh air throughout the day. Strategically placed wood-framed windows capture light and views without revealing nearby houses: A long, low window in the second-floor master bedroom frames a slice of courtyard; a light well illuminates artwork on a living room wall that otherwise receives little direct sunlight; and sheer sheets of glass in the dining room and tea room give sweeping views of crooked red pines, temples, and adjacent modern residences. For parties, Kim opens the glass doors on all sides of the courtyard to create a continuous living-dining-kitchen space open to the sky. 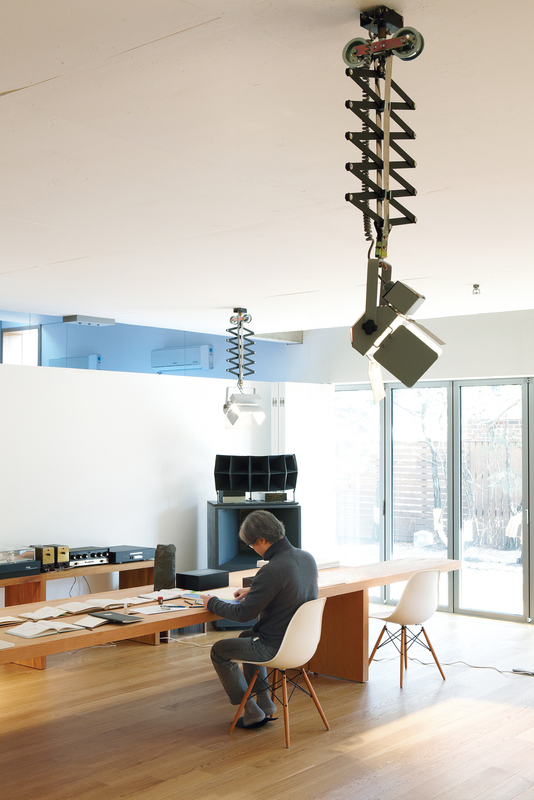 Even the basement, which is located beneath the courtyard and houses Cho’s studio, is bathed in sunshine from south-facing windows. But if air and light were constant considerations in designing the 4,600-square-foot home, construction materials and methods were equally important. “We spend a lot of time figuring out how to make buildings work in terms of physical construction, not just abstract ideas,” says Cho, who rarely attempts to disguise the raw materials of his craft. (“Wood is wood, concrete is concrete, and night is night” is how one of his employees puts it.) That’s not to say aesthetics get slighted: With a background in ceramics and sculpture, Cho has a knack for turning the constraints presented by a rough palette into artistic inspiration. The house’s exterior is a case in point. The underlying structure is concrete (the most common construction material in timber-scarce Korea) strengthened by steel wires, but Cho and Kim wanted to add a teak facade to portions of the outer walls. The recycled Indonesian boards they purchased were just a meter in length or shorter, however, so Cho cut them into even smaller, irregular lengths and attached them vertically to the con-crete. Separated by strips of zinc and accented by a pair of snow-dappled pine trees, the asymmetric panels become a two-story-tall abstract painting. Inside, contrasting slabs of wood, concrete, and glass form their own boxy abstractions. Some walls are covered in fine white paper, while others are raw concrete, marked with the imprint of the wood formwork used to pour them and the irregular drips where concrete oozed through during the process. A radiant heating system (typical of both traditional and modern Korean homes) warms the silky wood floors, and shiny floor-to-ceiling cabinets from Italy keep the rooms uncluttered and sleekly modern. There’s one room in the house that’s neither sleek nor particularly modern, however, and that’s the room Cho and Kim head for as soon as they shed their jackets on that snowy afternoon in January. It’s just a small box on the second floor, constructed of glass, wood, and white paper walls that glow with winter light, but somehow it seems to distill the spirit of the entire house. Each morning before Cho drives to his busy downtown office, he stands in the tea room and greets the sun with 108 bows. Now, as he and Kim perch on purple silk cushions and sip steaming cups of barley tea, it’s hard to remember they are in the middle of a sprawling megalopolis. High above the pines and blissfully removed from the sea of roofs below, they seem, instead, to have joined the world of the two black-and-white Korean magpies that glide silently past on the other side of the glass.